Exploring the Valle de Guadalupe in Baja California over the holidays, I was on a mission to eat at as many of the incredible restaurants. On the final evening of my visit, I went to Corazon de Tierra, a restaurant located adjacent to the Vena Cava winery. At the head of Corazon de Tierra is the young and talented chef Diego Hernandez, a leader in the modern Mexican cooking movement, who has been awarded Latin America World’s 50 Best winner for the restaurant. While I was enjoying my dinner, I learned that Chef Hernandez was in the process of opening a restaurant in Los Angeles in the old Dominick’s space in West Hollywood. I waited in anticipation! The anticipation was worth it and it exceeded my expectations. 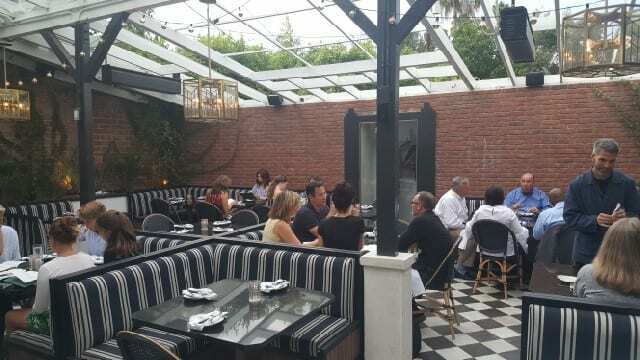 Located in the former Dominick’s space, Verlaine is an outdoor space with a retractable roof. 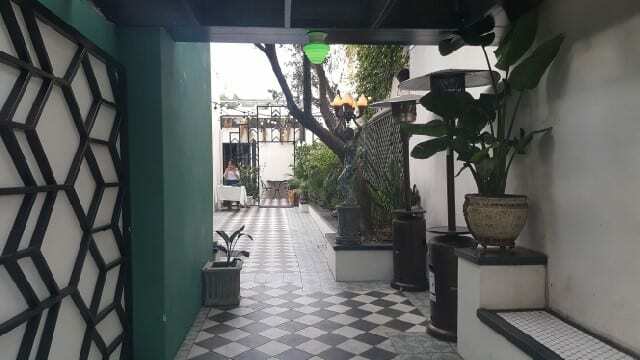 The front door is covered with greens and opens to a tiled walkway that was previously a parking space. The outdoor patio is warm and inviting. Comfortable booths, geometric tiled floors, exposed brick, fresh greenery and a retracted room, it is a lovely environment for a warn night in Los Angeles. As for the indoor space, it has been converted to an intimate cocktail lounge called Wild Beast. The menu is modern Mexican with a California influence. Two pages in length, all of the dishes are wonderful for sharing but you may not want to after tasting the delicate flavors. 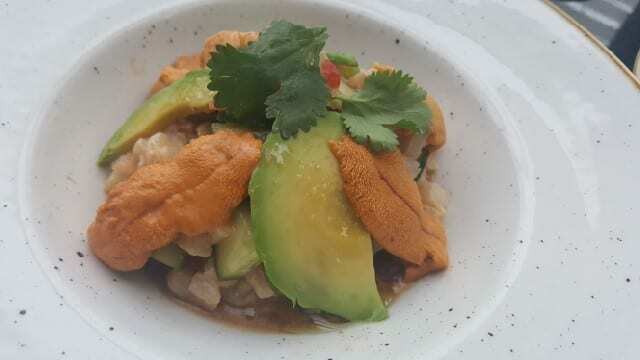 Fish Ceviche – Generally made with Hiramasa yellowtail, the ceviche is amazingly fresh and the tartness from the lime does not overpower the fish. The small pieces of chili add a touch of heat, which is balanced by the avocado slices. Fresh uni can be added on top which added a lovely savory quality to the ceviche, which is also served with house made tostadas on the side. 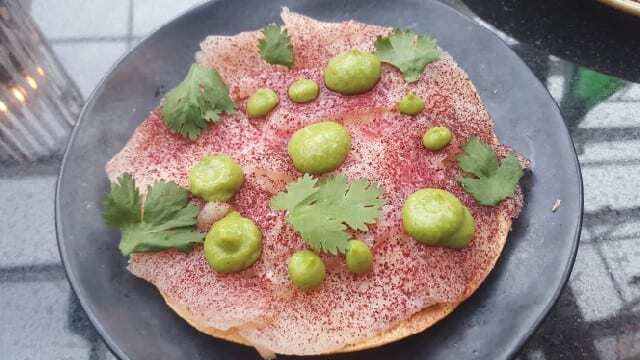 Fish Tostada – Thinly sliced Hiramasa yellowtail is laid across a fresh tostada with a thin layer of mayonnaise underneath. On top of the fish, there is avocado, cilantro and hibiscus dust, which adds color. 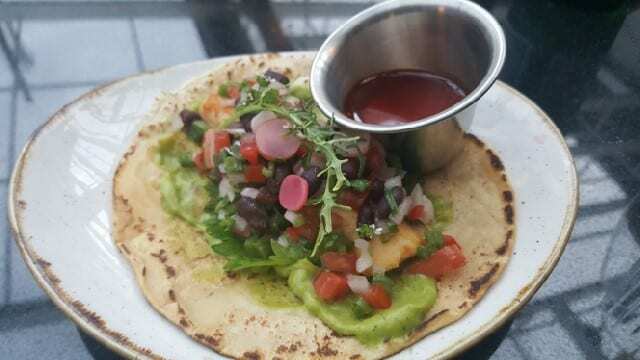 The fish is so delicate, almost silky, and the fresh tostada adds texture more than flavor. Homemade Tacos – Sardines, octopus or short rib are the proteins choices for the tacos. 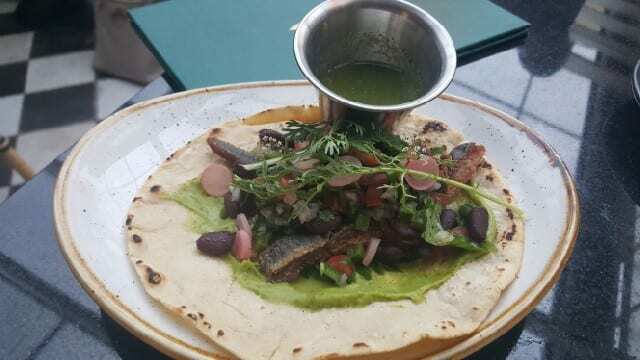 A single fresh corn tortilla is served with cactus salad, pickled black bean and avocado-puree and then topped with sardines that are charred and salty or thick cuts of octopus that is tender and meaty. 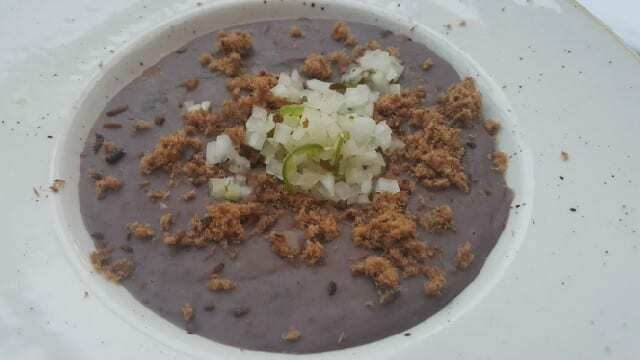 Soft Fried Black Beans – A bowl of creamy soft fried black beans is served with carne seca (almost jerky-like pork), onions and chilis on top. Underneath are small cubes of queso fresco. Spoon it on to fresh flour tortillas to enjoy but once you finish you tortillas, I am sure you will keep eating the beans with a spoon. 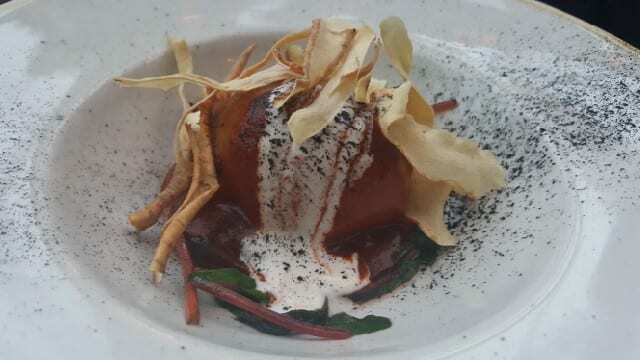 Sorrel Tamal – The round ball of masa sits on top of swiss chard and is swathed in a mole amarillito with an onion ash dust. The masa is light and airy, almost melting in the mouth as the savoriness of the mole and the bitterness of the swiss chard find harmony. Fish of the Day – The fish of the day was a rock cod served with lentils, bacon and clam. To enjoy with our meal, we ordered wine-by-the-glass from the well-put together wine list. The wine list has an equal balance of white and red wines and features small-producer wines from California, France and Italy. 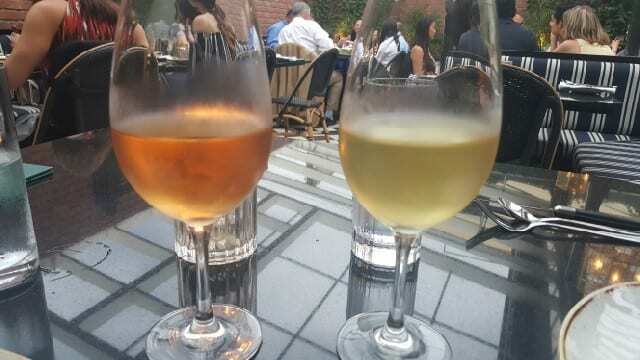 I enjoyed a trousseau gris from California while my friend enjoyed a glass of vermentino. 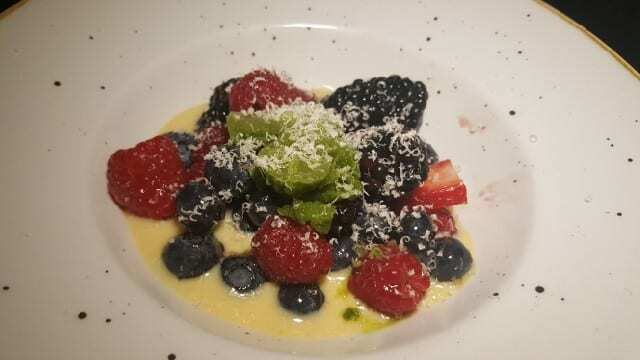 Nectarine Berry Cream – On a hot summer night, the fresh berries are bathed in a mild cream and served with Thai basil granita and shaved almond. Light, delicate, refreshing with a hint of herbaciousness from the granita, this was the perfect dish to end our night. 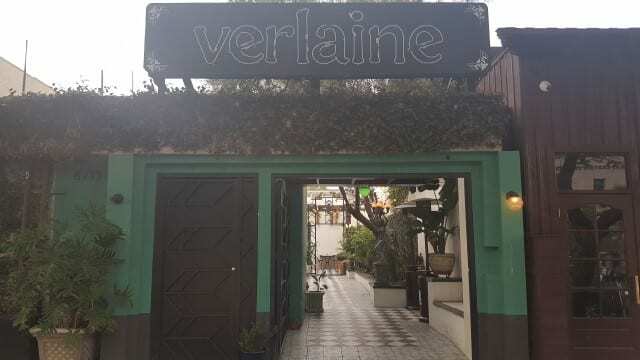 My meal at Verlaine was suberb; one of the best meals I have had of late. Chef Diego Hernandez is a real talent and we are very lucky to have him in Los Angeles. 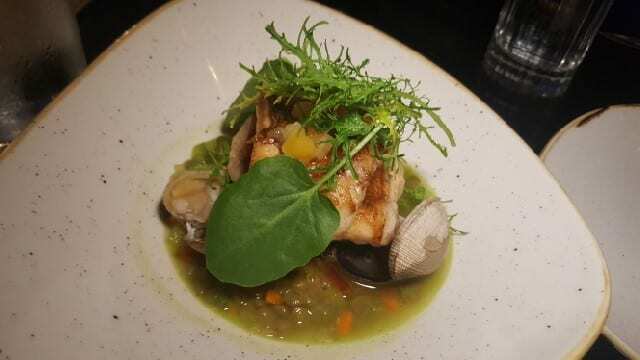 I loved the delicate flavors of each dish, as well as the ambiance, and cannot wait to return. 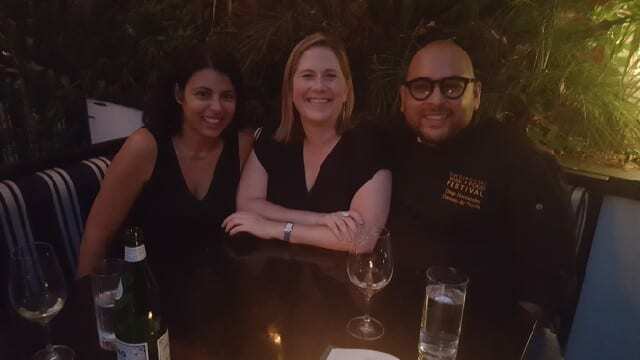 This entry was posted in Food and tagged chef Diego Hernandez, food, Los Angeles, modern Mexican, outdoor dining, restaurant, Verlaine, West Hollywood by Allison Levine.